has been working intensively with protein biotinylation in the past 10 years and has performed custom biotinylation in a variety of scales for customers in academia and industry. We can biotinylate any protein desired. Creative BioMart has developed a variety of methods of biotinylation both in vitro and in vivo. Custom can therefore choose an optimal biotinylation method specific for your application without loss of bioactivity . Simple and efficient biotin labeling without altering the bioactivity of target proteins. Biotinylated proteins immobilization on Streptavidin coated surfaces/beads. Chemical moiety to react with amine, sulfhydryl, carboxyl or phosphate groups of proteins. 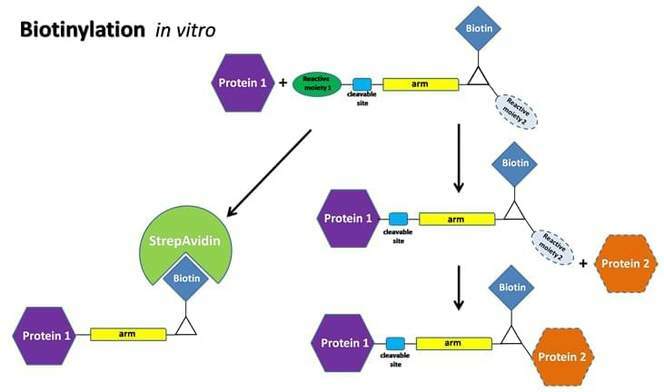 Biotinylation with different spacer arm lengths to reduce steric hindrances associated with streptavidin binding and allow for efficient capturing of biotinylated proteins. Derivatives of biotin cleavable or reversible allow for a gentle way of dissociation of biotin from streptavidin. Besides in vitro biotinylation, our platform offers the most efficient in vivo biotinylation. On this platform, amino acid sequence (the Biotin acceptor peptide, BtAP) is genetically fused with the target protein of interest. The BtAP serves as an in vivo substrate for E. coli biotin holoenzymesynthetase (BirA), an enzyme that biotinylates E.coli biotin carboxyl carrier protein (BCCP). We have developed a highly efficient bacterial expression vector that allows expression of the target protein fused with BtAP and expression of the BirA gene under a bacterial operon. Using this vector and an optimized bacterial host strain, the BtAP-fused target protein and BirA are co-expressed and the target protein will be fully biotinylated in vivo . Biotinylation occurs in cell regardless of the fusing site of BtAP at the N-terminus, C-terminus or in the loops of the target protein. We have also established a mammalian in vivo protein biotinylation platform to product BtAP fused biotinylated proteins in mammalian cells.